The Grinch, a green-haired hermit living high atop Mount Crumpet, hates Christmas. 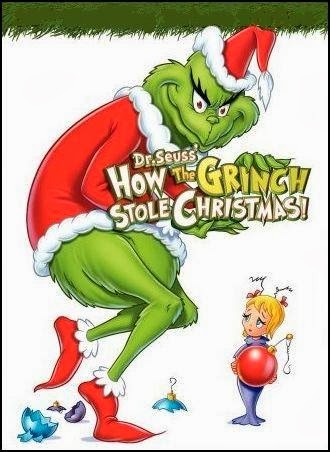 Enraged by the music and laughter emanating from the nearby town of Whoville, the Grinch, with the help of his trusty canine Max, dresses up like Santa Claus, and, once all the Whos are tucked safely into bed, descends upon Whoville to swipe every Christmas decoration, every present, every tree. He takes it all, right down to the Roast Beast, the Whos’ traditional Christmas supper! Hoping the loss of these items will end the festivities, the Grinch instead learns that, no matter how hard you try, you can’t keep Christmas from coming! How the Grinch Stole Christmas! was a perfect storm of creativity, merging the talents of its director (Chuck Jones, who, for years, brought Bugs Bunny and Daffy Duck to life for Warner Brothers), narrator (the great Boris Karloff, mixing gentle sophistication with a touch of madness), and, of course, Theodor Geisel, aka Dr. Seuss, whose penchant for nonsensical rhymes has entertained children for generations (as a kid, my favorite Dr. Seuss book was Green Eggs and Ham, but I also loved the chaos of The Cat in the Hat). Through their combined efforts, a Holiday masterpiece was created, featuring a central character every bit as nasty as Ebenezer Scrooge. The scenes that always stand out for me are the ones where the Grinch is carrying out his diabolical plan, an evil grin affixed to his face as he fills sack after sack with the Whos’ Christmas cheer, all as the song You’re a Mean One, Mr. Grinch, sung by Thurl Ravenscroft, fills the soundtrack. These sequences are wonderful, and are rivaled only by the film’s incredibly moving finale (as upbeat endings go, How the Grinch Stole Christmas! has one of the finest ever conceived). The mid-’60s was a magical time for Holiday-themed animation, with Rudolph, The Red-Nosed Reindeer (1964), A Charlie Brown Christmas (’65), and How the Grinch Stole Christmas! (in ’66) all released within three years of each other. Clearly, this was the “Golden Age” of Christmas shows, and over the years, very few specials have come close to matching this trio’s popularity. They are, quite simply, the best of the bunch.